"Drachma" redirects here. For the moth genus, see Drachma (moth). Three modern Greek currencies, the first introduced in 1832 and the last replaced by the euro in 2001 (at the rate of 340.75 drachma to the euro). The euro did not begin circulating until 2002 but the exchange rate was fixed on 19 June 2000, with legal introduction of the euro taking place in January 2002. It was also a small unit of weight. Silver tetrobol (4/6 of drachma) from Massalia. Obverse: Artemis wearing stephane. Reverse: ΜΑΣΣΑ[ΛΙΗΤΩΝ] (of Massalians), lion standing right. The name drachma is derived from the verb δράσσομαι (drássomai, "(I) grasp"). [n 3] It is believed that the same word with the meaning of "handful" or "handle" is found in Linear B tablets of the Mycenean Pylos. [n 4] Initially a drachma was a fistful (a "grasp") of six oboloí or obeloí (metal sticks, literally "spits") used as a form of currency as early as 1100 BC and being a form of "bullion": bronze, copper, or iron ingots denominated by weight. A hoard of over 150 rod-shaped obeloi was uncovered at Heraion of Argos in Peloponnese. Six of them are displayed at the Numismatic Museum of Athens. It was the standard unit of silver coinage at most ancient Greek mints, and the name obol was used to describe a coin that was one-sixth of a drachma. The notion that drachma derived from the word for fistful was recorded by Herakleides of Pontos (387–312 BC) who was informed by the priests of Heraion that Pheidon, king of Argos, dedicated rod-shaped obeloi to Heraion. Similar information about Pheidon's obeloi was also recorded at the Parian Chronicle. Ancient Greek coins normally had distinctive names in daily use. The Athenian tetradrachm was called owl, the Aeginetic stater was called chelone, the Corinthian stater was called hippos (horse) and so on. Each city would mint its own and have them stamped with recognizable symbols of the city, known as badge in numismatics, along with suitable inscriptions, and they would often be referred to either by the name of the city or of the image depicted. The exact exchange value of each was determined by the quantity and quality of the metal, which reflected on the reputation of each mint. Among the Greek cities that used the drachma were: Abdera, Abydos, Alexandria, Aetna, Antioch, Athens, Chios, Cyzicus, Corinth, Ephesus, Eretria, Gela, Catana, Kos, Maronia, Naxos, Pella, Pergamum, Rhegion, Salamis, Smyrni, Sparta, Syracuse, Tarsus, Thasos, Tenedos, Troy and more. The 5th century BC Athenian tetradrachm ("four drachmae") coin was perhaps the most widely used coin in the Greek world prior to the time of Alexander the Great (along with the Corinthian stater). It featured the helmeted profile bust of Athena on the obverse (front) and an owl on the reverse (back). In daily use they were called γλαῦκες glaukes (owls), hence the proverb Γλαῦκ’ Ἀθήναζε, 'an owl to Athens', referring to something that was in plentiful supply, like 'coals to Newcastle'. The reverse is featured on the national side of the modern Greek 1 euro coin. 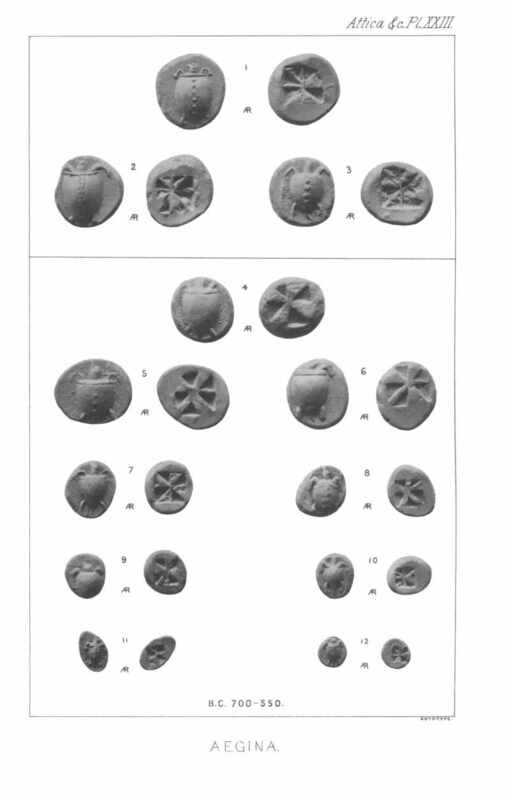 Drachmae were minted on different weight standards at different Greek mints. The standard that came to be most commonly used was the Athenian or Attic one, which weighed a little over 4.3 grams. After Alexander the Great's conquests, the name drachma was used in many of the Hellenistic kingdoms in the Middle East, including the Ptolemaic kingdom in Alexandria and the Parthian Empire based in what is modern-day Iran. The Arabic unit of currency known as dirham (Arabic: درهم‎), known from pre-Islamic times and afterwards, inherited its name from the drachma or didrachm (δίδραχμον, 2 drachmae); the dirham is still the name of the official currencies of Morocco and the United Arab Emirates. The Armenian dram (Armenian: Դրամ) also derives its name from the drachma. It is difficult to estimate comparative exchange rates with modern currency because the range of products produced by economies of centuries gone by were different from today, which makes purchasing power parity (PPP) calculations very difficult; however, some historians and economists have estimated that in the 5th century BC a drachma had a rough value of 25 U.S. dollars (in the year 1990 – equivalent to 46.50 USD in 2015), whereas classical historians regularly say that in the heyday of ancient Greece (the fifth and fourth centuries) the daily wage for a skilled worker or a hoplite was one drachma, and for a heliast (juror) half a drachma since 425 BC. Modern commentators derived from Xenophon that half a drachma per day (360 days per year) would provide "a comfortable subsistence" for "the poor citizens" (for the head of a household in 355 BC). Earlier in 422 BC, we also see in Aristophanes (Wasps, line 300–302) that the daily half-drachma of a juror is just enough for the daily subsistence of a family of three. A modern person might think of one drachma as the rough equivalent of a skilled worker's daily pay in the place where they live, which could be as low as US$1, or as high as $100, depending on the country. Fractions and multiples of the drachma were minted by many states, most notably in Ptolemaic Egypt, which minted large coins in gold, silver and bronze. Notable Ptolemaic coins included the gold pentadrachm and octadrachm, and silver tetradrachm, decadrachm and pentakaidecadrachm. This was especially noteworthy as it would not be until the introduction of the Guldengroschen in 1486 that coins of substantial size (particularly in silver) would be minted in significant quantities. For the Roman successors of the drachma, see Roman provincial coins. The weight of the silver drachma was approximately 4.3 grams or 0.15 ounces, although weights varied significantly from one city-state to another. It was divided into six obols of 0.72 grams, which were subdivided into four tetartemoria of 0.18 grams, one of the smallest coins ever struck, approximately 5–7 mm in diameter. Minae and talents were never actually minted: they represented weight measures used for commodities (e.g. grain) as well as metals like silver or gold. The New Testament mentions both didrachma and, by implication, tetradrachma in context of the Temple tax. Luke's Gospel includes a parable told by Jesus of a woman with 10 drachmae, who lost one and searched her home until she found it. 200, 1000, 5000, 10,000 Δρ. 10 Λ., 20 Λ., 50 Λ., 1 and 2 Δρ. The first coinage consisted of copper denominations of 1, 2, 5 and 10 lepta, silver denominations of ​1⁄4, ​1⁄2, 1 and 5 drachmae and a gold coin of 20 drachmae. The drachma coin weighed 4.5 g and contained 90% silver, with the 20-drachma coin containing 5.8 g of gold. In 1894, cupro-nickel 5-, 10- and 20-lepta coins were introduced. No 1-lepton or 2-lepta coin had been issued since the late 1870s. Silver coins of 1 and 2 drachmae were last issued in 1911, and no coins were issued between 1912 and 1922, during which time the Latin Monetary Union collapsed due to World War I. Between 1926 and 1930, a new coinage was introduced for the new Hellenic Republic, consisting of cupro-nickel coins in denominations of 20 lepta, 50 lepta, 1 drachma, and 2 drachmae; nickel coins of 5 drachmae; and silver coins of 10 and 20 drachmae. These were the last coins issued for the first modern drachma, and none were issued for the second. Notes were issued by the National Bank of Greece from 1841 until 2001 when Greece joined the Euro. Early denominations ranged from 10 to 500 drachmae. Smaller denominations (1, 2, 3 and 5 drachmae) were issued from 1885, with the first 5-drachma notes being made by cutting 10-drachma notes in half. When Greece finally achieved its independence from the Ottoman Empire in 1828, the phoenix was introduced as the monetary unit; its use was short-lived, however, and in 1832 the phoenix was replaced by the drachma, adorned with the image of King Otto of Greece, who reigned as modern Greece's first king from 1832 to 1862. The drachma was divided into 100 lepta. In 2002 the drachma ceased to be legal tender after the euro, the monetary unit of the European Union, became Greece's sole currency. Between 1917 and 1920, the Greek government issued paper money in denominations of 10 lepta, 50 lepta, 1 drachma, 2 drachmae, and 5 drachmae. The National Bank of Greece introduced 1000-drachma notes in 1901, and the Bank of Greece introduced 5,000-drachma notes in 1928. The economic depression of the 1920s affected many nations around the globe, including Greece. In 1922, the Greek government issued a forced loan in order to finance their growing budget deficit. On April 1, 1922, the government decreed that half of all bank notes had to be surrendered and exchanged for 6.5% bonds. The notes were then cut in half, with the portion bearing the Greek crown standing in for the bonds while the other half was exchanged for a new issue of central bank notes at half the original value.The Greek government again issued notes between 1940 and 1944, in denominations ranging from 50 lepta to 20 drachmae. 5 Drachma note that has been cut in half by government for the purpose of issuing bonds. During the German–Italian occupation of Greece from 1941 to 1944, catastrophic hyperinflation and Nazi looting of the Greek treasury caused much higher denominations to be issued, culminating in 100,000,000,000-drachma notes in 1944. In November 1944, after Greece was liberated from Germany, old drachmae were exchanged for new ones at the rate of 50,000,000,000 to 1. Only paper money was issued. The government issued notes of 1, 5, 10 and 20 drachmae, with the Bank of Greece issuing 50-, 100-, 500-, 1000-, 5000-, and 10,000-drachma notes. This drachma also suffered from high inflation. The government later issued 100-, 500-, and 1000-drachma notes, and the Bank of Greece issued 20,000-and 50,000-drachma notes. In 1953, in an effort to halt inflation, Greece joined the Bretton Woods system. In 1954, the drachma was revalued at a rate of 1000 to 1. The new currency was pegged at 30 drachmae = 1 United States dollar. In 1973, the Bretton Woods System was abolished; over the next 25 years the official exchange rate gradually declined, reaching 400 drachmae to 1 U. S. dollar. On 1 January 2002, the Greek drachma was officially replaced as the circulating currency by the euro, and it has not been legal tender since 1 March 2002. The first issue of coins minted in 1954 consisted of holed aluminium 5-, 10- and 20-lepton pieces, with 50-lepton, 1-, 2-, 5- and 10-drachma pieces in cupro-nickel. A silver 20-drachma piece was issued in 1960, replacing the 20-drachma banknote, and also minted only in collector sets in 1965. Coins in denominations from 50 lepta to 20 drachmae carried a portrait of King Paul (1947–1964). New coins were introduced in 1966, ranging from 50 lepta to 10 drachmae, depicting King Constantine II (1964–1974). A silver 30 drachma coin for the centennial of Greece's royal dynasty was minted in 1963. The following year a non-circulating coin of this value was produced to commemorate the royal wedding. The reverse of all coins was altered in 1971 to reflect the military junta which was in power from 1967 to 1974. This design included a soldier standing in front of the flames of the rising phoenix. A 20-drachmae coin in cupro-nickel with an image of Europa on the obverse was issued in 1973. In the latter part of 1973, several new coin types were introduced: unholed aluminium (10 and 20 lepta), nickel-brass (50 lepta, 1 drachma, and 2 drachmae) and cupro-nickel (5, 10, and 20 drachmae). These provisional coins carried the design of the phoenix rising from the flame on the obverse, and used the country's new designation as the "Hellenic Republic", replacing the coins also issued in 1973 as the Kingdom of Greece with King Constantine II's portrait. A new series of all 8 denominations was introduced in 1976 carrying images of early national heroes on the smaller values. Cupro-nickel 50-drachmae coins were introduced in 1980. In 1986, nickel-brass 50-drachma coins were introduced, followed by copper 1- and 2-drachma pieces in 1988 and nickel-brass coins of 20 and 100 drachmae in 1990. In 2000, a set of 6 themed 500-drachma coins was issued to commemorate the 2004 Athens Olympic Games. 1 drachma (1973) during the 1973-1974 military-controlled "Republic"
The first issues of banknotes were in denominations of 10, 20 and 50 drachmae, soon followed by 100, 500 and 1000 drachmae by 1956. 5000-drachma notes were introduced in 1984, followed by 10,000-drachma notes in 1995 and 200-drachma notes in 1997. In Unicode, the currency symbol is U+20AF ₯ DRACHMA SIGN. There is a special Attic numeral, U+10142 𐅂 GREEK ACROPHONIC ATTIC ONE DRACHMA for the value of one drachma but it fails to render in most browsers. The Drachmi Greek Democratic Movement Five Stars which was founded in 2013, aims to restore the Drachma, as Greece's currency. The golden drachma is the main unit of currency in Rick Riordan's Percy Jackson & the Olympians series, as well as its spinoff The Heroes of Olympus, the latter of which also features the Roman denarius. The drachma is used in the video game Assassin's Creed Origins, set in Ptolemaic Egypt, as the currency used by the player to purchase weapons, outfits and mounts. It is also used in the subsequent game Assassin's Creed Odyssey, set in Ancient Greece. ^ [draːkʰmέː] is also attested. ^ δράσσομαι, drassomai, "grasp"; cf. : δράξ, drax, and drachma itself, i.e. "grasp with the hand". ^ "As much as one can hold in the hand". ^ The word, whose meaning and translation is still uncertain, is 𐀈𐀏𐀔, do-ka-ma or 𐀈𐀏𐀔𐀂, do-ka-ma-i, found on the PY An 1282 and PY Wr 1480 tablets. ^ Τριόβολον spelling variant is also attested. ^ Ἡμιοβόλιον spelling variant is also attested. ^ Greek: λεπτά; plural of λεπτόν, lepton. ^ Minted but rarely used. Usually, prices were rounded up to the next multiple of 10 drachmae. ^ a b Not minted but remained legal tender (not in actual use in 2002). ^ a b c d δραχμή. Liddell, Henry George; Scott, Robert; A Greek–English Lexicon at the Perseus Project. ^ Shelmerdine, Cynthia W.; Bennet, John (1 January 1995). "Two Linear B documents from Bronze Age Pylos". Kadmos. 34 (2). ^ "PY 1282 An (Ciii)". "PY 1480 Wr (unknown)", DĀMOS: Database of Mycenaean at Oslo, University of Oslo . ^ Raymoure, K.A. "do-ka-ma-i". Minoan Linear A & Mycenaean Linear B. Deaditerranean. ^ It was originally set at 1/6 drachma by Pericles, until Cleon raised it in 425 BC; see also Aristophanes, Knights (line 255) and Wasps (line 609, 684, 690, 788–790, 1121). ^ Cf. footnote 18 of H. G. Dakyns's translation of Ways and Means: A Pamphlet on Revenues alias On Revenues (The Works of Xenophon, Macmillan, 1897). This footnote is quoting George Grote (Plato, and the Other Companions of Sokrates, vol. 3, J. Murray, 1865, p.597). ^ "The first modern drachma coins catalog". Retrieved 22 June 2013. ^ "Banknote Index". banknoteindex.com. Retrieved 1 February 2019. ^ "History of Greek Banknotes". Greekcurrency.110mb.com. Retrieved 17 November 2013. ^ "Political Party Drachma 5 Launched". greekreporter.com. Wikimedia Commons has media related to Drachma. Wikimedia Commons has media related to Modern drachma. Wikimedia Commons has media related to Banknotes of Greece.